New route and a new 12k PR at the Live Great Eastern Run. 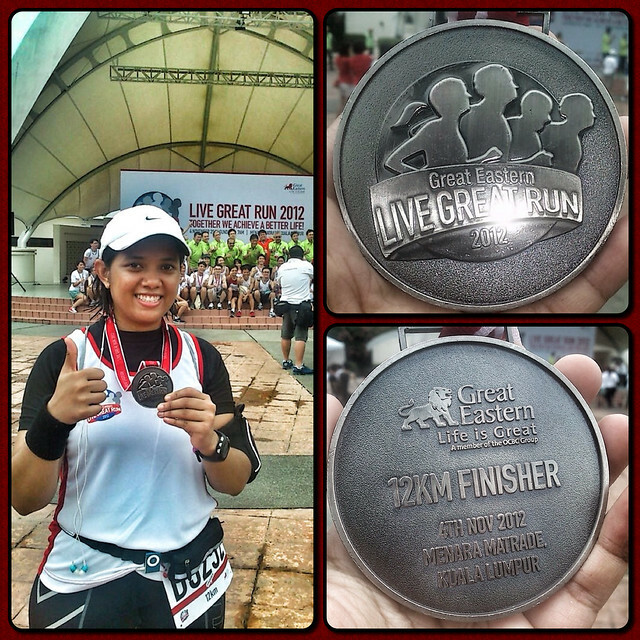 A week after completing my first half marathon race, I joined another event (race addict much?) – this time held by insurance company Great Eastern. They called it the Live Great Eastern Run and in its debut running event there were two categories to choose from: a 12km and a funny 3km run in which couples team up and run together in a t-shirt that had two collars! I chose to run the 12k, excited about running a completely new-to-me route. The race was mostly set in the upscale neighborhood of Hartamas and start/finish point was at the unique-looking Menara MATRADE (next to High Court Kuala Lumpur). The flag-off time was scheduled at 7am and I got to the venue at about 45 minutes before then to warm up and scope the place out. Traffic flow to the parking area was well-manned by the volunteers, which I really liked as a driver (stress-free). This race did not have as many people in comparison to other races I had been to, in fact the 12km run “only” registered some 3,000+ participants. As we’re waiting in the race pen, the two emcees (a guy and a girl) tried to engage the crowd of runners by leading them in a warm-up session – which I thought was silly because everyone’s literally rubbed up against each other, star jumping would’ve been a terrible idea. Plus I was sure most had already done their own warm ups prior. The female emcee (who is a well-known DJ from an established radio station) kept referring to the 12km race as a “marathon.” I know she’s not a runner and doesn’t know how long a full marathon is, but it was a little bit of a pet peeve. At this point most people were tuning her out because they were slightly irked at her ignorance. The male emcee however had a better clue and referred to it as a “race”. It was already 7am and we’re supposed to have started running but the emcees delayed us as they wanted to wait for other runners who were still making their way to the starting area. A man (you know, the uncle-uncle type) yelled out, “Idiot, we’re late!” and quite a number of other runners grumbled out loudly, others were more subtle and kept looking at their watches, but you could tell people were annoyed. This is the only race I have been to where the flag-off was not precisely on time. Finally at 7:04am after much booing from the crowd, they flagged us off! (honestly I had no idea some runners could be so foul-mouthed). And off we went, dissipating into the distance and into Hartamas country. The first mile of the route was nice in that it was downhill all the way from MATRADE and past the National Archive Department and the majestic KL High Court. But very soon after I discovered that the road ahead was peppered with hills! Oh how hilly you are, dear race. I worked my way up the hills patiently with every step, taking shorter strides, and then as soon as the uphill became the opposite I let gravity do the work. Practicing during race kit pickup day at GE Mall. We ran on some parts of Jalan Duta and then right into the heart of the neighborhoods of Hartamas Heights, Duta Nusantara and Taman Sri Hartamas. After about 6km we U-turned back and retraced to route back to MATRADE. But not without first encountering the two obstacles mid-way in front of Plaza Damas which are supposed to symbolize life’s challenges that we need to climb over (an insurance company’s funny way of injecting some fun into the race). If you ask me, the running was probably more of the obstacle than the few seconds of ‘rest’ we had to climb over the water-filled plastic barriers! And just after that, there was a sponge station, which is pretty unheard of in races shorter than half marathons. I took a wet sponge anyway to cool myself down. After the obstacles and the sponges, I ran on and proceeded downhill along Jalan Sri Hartamas 1, passing by Istana Negara (National Palace) and the Wilayah National Mosque on my right. I pushed my pace and maintained it until the finish line, completing my 12k run in a PR of 01:27:32. Humbly happy! After I picked up my medal and race goodie bag, a friendly voice said “Hi!” to me from the back. I turned around and it was Edan Shah, a trainer I knew from the Nike training sessions. I felt honored he remembered me because Edan is somewhat of an icon in the local running scene. He was walking around with a lanyard that had a card at the end which said “Potential Winner”, an acknowledgement that any top finisher awaits the final decision for with bated breath. 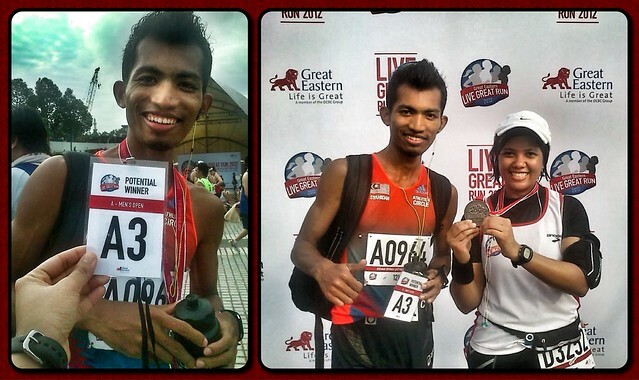 In the end, it was final – Edan finished 3rd place in the men’s open at Great Eastern 12k Run! 47 minutes if I am not mistaken. Congratulations, dude! The medal – oh I love the medal, very cool! Plus it is the first one I have which clearly shows a silhouette of a woman on the left (see the pony-tailed shadow). Women represent! For a race that’s being held for the first time, GE hit a lot of bull’s eye in getting it right for us runners. I definitely and highly recommend anyone who wants to try it next year. My medal and I. Behind me are all the top 3 winners for all the categories!